Corey Starr serves up some fried haddock at BW’s Smokin’ Barrels Barbecue in Blasdell. BW’s will attempt to break the Guinness world record for fish fry dinners. You’re going to have a tough time finding a $10 fish fry this Lenten season. Plan on $12, or even $13. If any dish has a chance of surpassing chicken wings as Buffalo’s signature meal, it might be a plate of steaming fried haddock – Buffalo’s fish of choice for fish fry – with a heap of potato salad, coleslaw and a roll. But as Ash Wednesday approaches next week, restaurants are facing a steep increase in the price of haddock. The reason? The Atlantic haddock haul is down. Some restaurants and church halls are taking a chance on turning off customers and are raising the price of fish fries by a dollar or two. Others are taking a profit cut. “The price is eating into everybody’s back pocket. We’re all making a little bit less,” said Bruce Will, owner of BW’s Smokin’ Barrels Barbecue of Blasdell. The price hike weighs especially heavily on Will, who is getting ready for the sixth annual Kiwanis Club takeout and pre-Lent fundraiser at East Aurora’s Parkdale Elementary School parking lot from 4 to 7 p.m. today. Will is attempting a challenge of a world record of 2,552 fish fry dinners set by Arcade caterer Krolick’s BBQ. BW’s will keep the price down this evening since the thousand-plus $10 takeout meals they expect to sell will still lead to profits. “We are ready to break the record,” said Will who made 1,840 for last year’s takeout and 2,192 the year before. Numbers can fluctuate depending on how wintry the weather is, but as more fans discover they can get a fish fry without leaving the car, there’s been a steady climb in customers. With a case of 30 frozen haddock filets costing about $100 instead of the $80 cost last year, restaurateurs and fish shops across the region have had to recalibrate their sales strategy. Lenten fish fries are an old tradition that has brought communities together. They started out as church fundraisers where parish women would fry up the fish in church hall kitchens. Now, with caterers’ help, the fundraising tradition continues, selling an average of 250 dinners and making $2 to $4 in profit on each one, said Will. Even without breaking the record, the annual fish fry helps the Kiwanis Club raise about $8,000 for local charity projects, like the Boys and Girls Club. While Will won’t reveal what he charges to make hand-dipped, beer battered fish for his clients, he told them to consider selling dinners for $12 to $14 instead of the usual $8 or $9. The reason why haddock prices have climbed is complicated, said John Sackton, editor of Seafood.com News in Lexington, Mass. Frozen haddock traditionally has been used in fish fries because it has been more plentiful, and people in the Northeast developed a taste for it. The cheap frozen haddock used in fish fries now comes from farther away, where slimmer supplies led the price to climb, said Sackton. The haddock is packed in China after being caught in the Atlantic Ocean around Norway and Iceland, where the stocks have declined by about half, said Sackton. This time last year frozen haddock was selling for $2.60 a pound. Now it’s closer to $3.90. By contrast, numbers of cod, a similar but chewier fish, have grown to record levels in the same waters and prices have dropped, he said. This time last year frozen cod was $3.10 a pound. Now it’s $2.95. 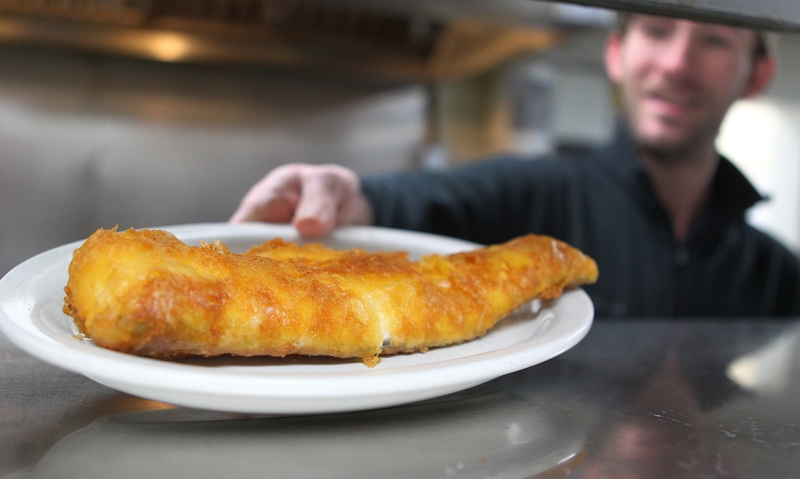 For Stan Krolick, the Lenten fish fries are an opportunity tinged with a poignant downside. He and his son Jake crunched the numbers and decided to sell their haddock dinners for almost the same as last year. Instead of $7.10 a meal, it’s now $7.25. This way churches trying to raise money can sell plates for about $10 and still make a few dollars on each. This week they were scheduled to cater about 54 fish fries, listed at krolicks.com. That’s about seven fish fries for each of the seven Fridays of Lent and about 15,000 fish, said Stan Krolick. That total is much better than what they did last year. Yet it is his rival’s effort tonight to break the fish fry record that makes him feel blue. He was game when the Polish Heritage Festival asked Krolick in 2008 to try beating the Guinness fish fry record of 2,550 that had been set in England with fish and chips. He invested thousands of dollars in advertising. It cost $6,000 just to fly in and lodge a Guinness judge that year. Krolick used his secret batter with garlic that he developed cooking perch he caught ice fishing. On a Friday at the end of May, they got a beautiful day and a good crowd. By ending the fry with a final batch of 250 extra meals for an East Side soup kitchen, Krolick beat the record by two with 2,552.